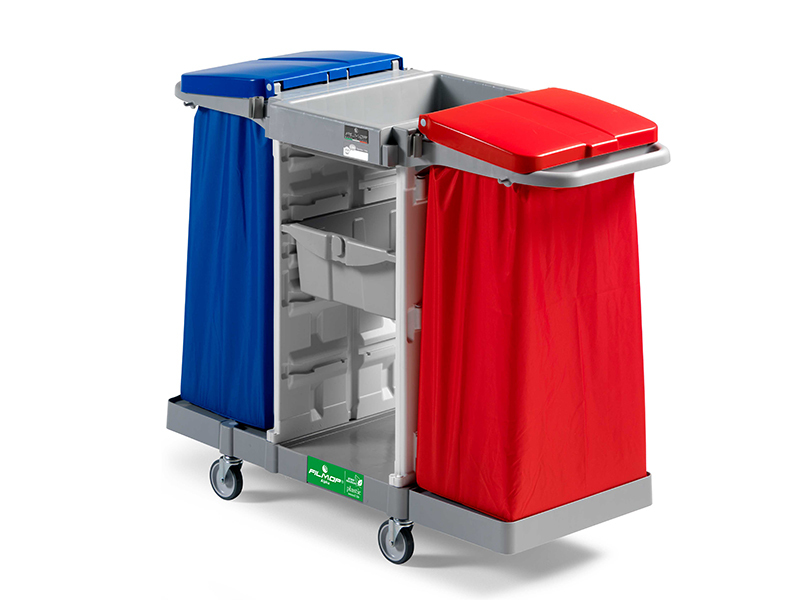 Trolley ideal for waste collection and the transport of cleaning products and equipments. * Strong, compact, ergonomic, modular trolley, easy to assemble and clean. * Green: environment friendly as made of recycled “Plastic Second Life” polypropylene copolymer. 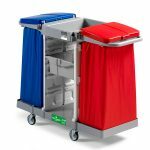 * Its plastic vertical frames guarantee the maximum hygiene, being the waste bag always separated from the rest of the trolley. * Plastic vertical frames with external slots for side baskets. * Bagholders equipped with ergonomic push-bar, handle supports and hook. system with removable key, and of shelves. * Possibility to close the trolley completely with side wall and side closing door.